With many white beaches contrasting with emerald waters choosing your accommodation base right is important as some areas are vibrant, some relaxed and others secluded requiring boat transfer to attractions like shops and restaurants. With this in mind we offer a brief description of the best places to stay in Phi Phi Island and list the top resorts you may book with confidence. Tonsai Bay is where the biggest concentration of cheap hotels, a rocking nightlife scene and many restaurants, curio shops and vendors are located along narrow alleys. It is the busiest area and always buzzing with young travelers and backpackers offering mainly 3 star accommodation and cheap rooms. If you like it busy and cosmopolitan, Tonsai will serve you well. The best area for budget travelers wanting tranquility is Long Beach featuring the whitest sand on the island and is only 5 minutes by boat from the action in Tonsai. Walking from Tonsai across the width of the island which takes 5 minutes is chilled-out Loh Dalam Bay flanked by limestone cliffs on both sides. It is conveniently near entertainment, yet shielded from noise. But if you really want to experience the island's full idyllic glory in an unsurpassed location and enjoy exclusivity the best beach to stay is Laem Tong on the north-east shore where places like Zeavola and just south of that Phi Phi Island Village Beach Resort offers barefoot luxury like nowhere else. 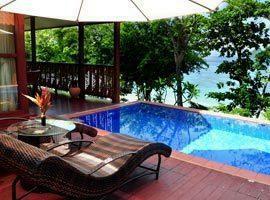 It is 20 minutes by boat from Tonsai and utterly romantic with a high degree of privacy. 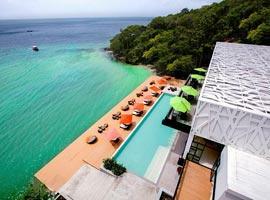 Located on Laem Tong you are assured tranquility and unhindered relaxation. 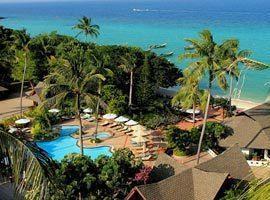 It offers charming cottages and suites on the beach, 2 pools, free Wi-fi internet, a spa, gym and feature a dive centre. 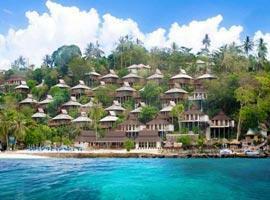 Located on Long Beach you are 10 minutes by longtail boat from vibrant Tonsai Village. The location is peaceful and relaxed and offer rooms with large glass sliding doors opening directly onto the beach. There is no other place on the island where you can stay closer to the water than this. An infinity pool merge with the ocean, you can dine and wine on the deck and villas have private balconies with great views. Located in Laem Hin you are outside the bustle of Tonsai Village, yet near enough to walk there. Because the cottages are free standing and outdoor decks are shielded by trees it offers extra privacy. If you are looking for a late night party scene this is not the place to come to. It does however feature its own bars and live entertainment on a beach used only by its guests and offer romantic sea view villas. Offers charming Thai designed cottages and a 2 bedroom villa which makes a stay with kids or as a group extra comfortable. 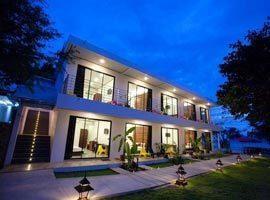 Located on restful Laem Tong nothing ever disturbs the peace. 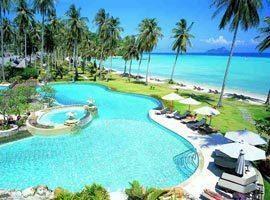 Couples on a budget who prefer a quiet secluded location will find Phi Phi Relax Resort a rare find. You are right by a snorkeling hotspot and longtail boats always lie in wait to take you to Tonsai Village. For a recommended budget stay with the best views in Long Beach this resort is without rival. Villas with private balconies cascade down a palm tree dotted hillside revealing exotic panoramas. Our vote for the best honeymoon hotel goes to Zeavola. It is located on a quiet beach where you will enjoy a high degree of privacy. Its villas dot a hillside clad in lush jungle and reveal stunning views.